Vail’s Lindsey Vonn will head into next week’s 2018 Winter Olympic Games in Pyeongchang with a full head of steam as she won her third World Cup race of the season on Saturday — the women’s record 80th win of her storied career. Vonn twice finished second on the Pyeongchang speed-event courses (downhill and super-G) last season, so her goal of another Olympic gold to match her 2010 Vancouver victory seems well within grasp after she missed the 2014 Sochi Games due to injury. Vonn also inched closer to the overall World Cup record of 86 career wins held by Sweden’s Ingemar Stenmark. Lindsey Vonn’s (Vail, Colo.) Olympic Winter Games preparation is right on target following her 80th career FIS Ski World Cup victory on the Kandahar downhill track in Garmisch-Partenkirchen, Germany, Saturday. Italy’s Sofia Goggia finished second, followed by Austria’s Cornelia Huetter in third. Breezy Johnson (Victor, Idaho) just missed the podium, posting a career-best World Cup finish in fourth. Alice McKennis (Glenwood Springs, Colo.) was 17th; Stacey Cook (Mammoth Mountain, Calif.) was 22nd, and Alice Merryweather (Hingham, Mass. ), who was just added to the U.S. Olympic Alpine Team Saturday, was 37th. Jackie Wiles (Portland, Ore.) and Laurenne Ross (Bend, Ore.) both crashed. Ross did ski to the finish, however, Wiles was taken off the course in a sled and is being treated for a left leg injury. There is no confirmation yet on any impact to her Olympic Team status. Saturday’s race was scheduled to be a two-run downhill sprint. However, weather canceled downhill training both Thursday and Friday, so the women ran a downhill training run prior to the race Saturday. Both the training run and race started from the super-G start. 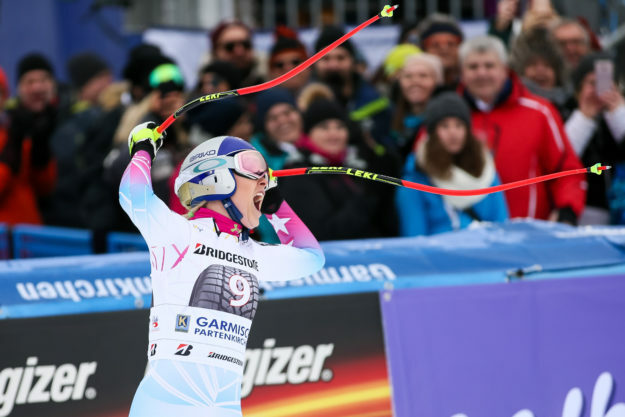 Saturday’s victory was Vonn’s fourth World Cup downhill win on the Kandahar track and her eighth career World Cup victory in Garmisch-Partenkirchen. Up next, the women compete in another downhill Sunday in Garmisch-Partenkirchen, which is scheduled as a full-length downhill event.